Submunitions that failed to explode during a cluster munition attack on Stakhanov on January 23. 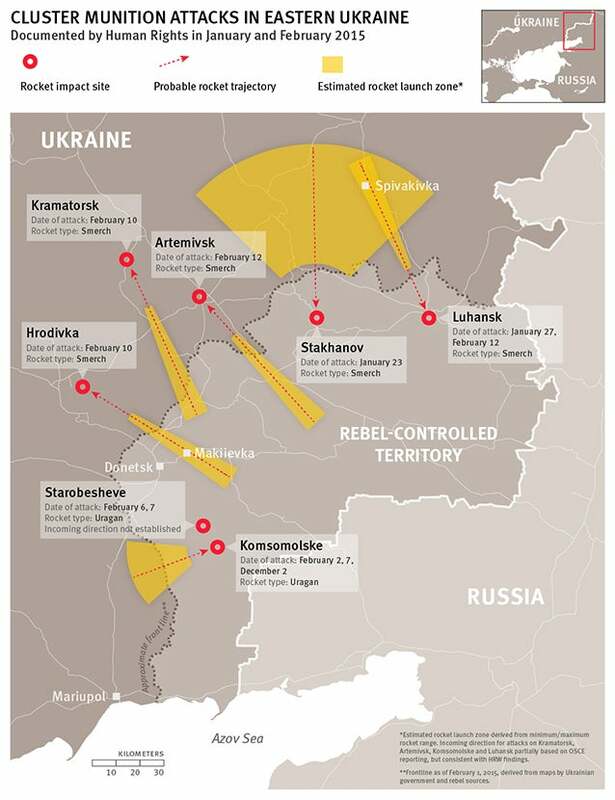 (Berlin) – Government and Russia-backed rebel forces repeatedly used cluster munitions in eastern Ukraine in January and February 2015, killing at least 13 civilians, including at least two children, Human Rights Watch said today. The use of cluster munitions in populated areas violates the laws of war due to the weapon’s indiscriminate nature and may constitute a war crime. Cluster munitions contain dozens or hundreds of smaller munitions, called submunitions, in a container such as a rocket or a bomb. After launch, the container opens up, dispersing the submunitions, which are designed to explode when they hit the ground. The submunitions are spread indiscriminately over a wide area, often the size of a football field, putting anyone in the area at the time of attack, whether combatants or civilians, at risk of death or injury. In addition, many of the submunitions do not explode on impact, but remain armed, becoming de facto landmines. Any location contaminated with dud submunitions remains hazardous until cleared by qualified personnel. During a 10-day investigation in eastern Ukraine, Human Rights Watch found evidence of attacks using cluster munition rockets in at least seven villages, towns, and cities between January 23 and February 12, with some locations hit multiple times. Human Rights Watch investigated the seven populated areas, three in government-controlled territory, and four in rebel-held territory. The weapons used were surface-fired 300 millimeter Smerch (Tornado) and 220 millimeter Uragan (Hurricane) cluster munition rockets, which deliver 9N210 or 9N235 antipersonnel fragmentation submunitions. Human Rights Watch gathered information, including photos of remnants, about cluster munition rocket attacks in other locations as well. Forces in rebel-held areas most likely launched the cluster munition attacks that struck government-controlled areas, and Ukrainian government forces most likely launched the cluster munition attacks that struck rebel-held areas, Human Rights Watch said. Human Rights Watch drew this conclusion based on an assessment of the impact location, including whether there were military targets in the vicinity, the direction of the attack, and the minimum and maximum ranges of the weapons used. For two attacks that hit rebel-controlled places, one in the city of Luhansk and another in Stakhanov, the direction and minimum range of the rockets used exclude the possibility that forces in rebel-controlled territory launched the cluster munitions. Human Rights Watch was able to identify the use of cluster munition rockets by observing the distinctive impact crater and fragmentation pattern that their submunitions create when they explode and by examining remnants of the submunitions found at the impact sites and by the remnants of the rockets found in the vicinity. To determine the direction of the attacks, Human Rights Watch examined rocket remnants, including the cargo, rocket motor, and tail sections of cluster munition rockets. In most cases, the tail sections were stuck in the ground, indicating the direction from which the rockets came. Human Rights Watch also analyzed craters and damage to buildings. In the cases Human Rights Watch investigated, the tail section also appeared to fly further than the submunitions, providing additional indication of the rocket’s direction. In three places Human Rights Watch documented that Uragan unguided high-explosive fragmentation (HE-Frag) rockets struck at the same time as cluster munition rockets. In at least two places, these HE-Frag rockets killed civilians. Human Rights Watch documented and condemned the use of unguided rockets in populated areas in July 2014 and January 2015. Human Rights Watch has previously documented the use of cluster munitions in eastern Ukraine. Though Ukrainian authorities have taken some steps to investigate findings of an October 2014 Human Rights Watch report, the investigation has been inadequate and more needs to be done, Human Rights Watch said. Both Ukrainian and Russian authorities have condemned cluster munition use in populated areas. Human Rights Watch believes that cluster munitions should never be used, even outside of populated areas, because of the risk of harming civilians. Human Rights Watch calls on Ukraine and Russia to join the 2008 Convention on Cluster Munitions prohibiting the use of cluster munitions in any circumstance. A total of 116 nations are party to the treaty, which also requires clearance of cluster munition remnants and assistance to victims of the weapons. Ukrainian authorities should immediately stop using cluster munitions, and Russia should under no circumstances provide cluster munitions to rebel forces and use its influence over the forces in Ukraine to end the use of cluster munitions, Human Rights Watch said. Both should investigate and hold accountable any personnel responsible for firing cluster munitions into populated areas, Human Rights Watch said. Human Rights Watch is a co-founder of the international Cluster Munition Coalition and serves as its chair. On February 13, 2015, cluster munitions were used in an attack on the northeastern part of Artemivsk, a government-controlled city in the Donetsk region about 25 kilometers north of the front lines. On February 18, Human Rights Watch examined multiple craters in a residential area consisting of detached houses. The craters were consistent with the use of the types of submunitions delivered by Smerch cluster munition rockets, and Human Rights Watch found a submunition stabilization fin near one of the craters. Local residents told Human Rights Watch that the attack had killed at least two people, a woman and a boy who had been playing with friends in a playground near the local school. A spokesperson for the Donetsk regional administration confirmed to Human Rights Watch that the attack had killed a woman and an 8-year-old boy. Local residents also described finding remnants of the weapon, such as a “pipe with holes,” a description consistent with the central part of the cluster munition rocket cargo section that can often be found as a remnant after a cluster munition attack. By the time Human Rights Watch arrived at the site, however, local authorities had removed the remnants. The Organization for Security and Cooperation in Europe (OSCE) monitors who examined the site shortly after the attack concluded that Smerch rockets had struck the area and that the attack had come from the southeast. Between noon and 1 p.m. on February 10, cluster munitions were used in an attack on at least two residential areas in Kramatorsk, a government-controlled city in Donetsk region, about 50 kilometers northwest of the front lines. A spokesperson for the Donetsk region administration told Human Rights Watch that the attack killed 5 civilians and 12 military servicemen, and that 34 people had required hospital treatment. Human Rights Watch investigated the impact areas on February 11 and 12. When we heard the first explosion we started running toward the entrance. But then many bombs started exploding all around us. Shrapnel was flying everywhere. I looked back and saw that one of my friends was holding his shoulder. A fragment also pierced my thigh. It wasn’t very painful at first, but I felt that my pants became wet from blood. We had to wait for a long time for the ambulance, and my head started spinning. Human Rights Watch documented 9 places where submunitions detonated in an area dotted with garages immediately adjacent to the airport in Kramatorsk, 20 in an area with multi-story apartment buildings just north of Parkovka Street near the airport, and 13 closer to the center along Lenin Street, including two that struck the grounds of a hospital. The same attack also struck the airport, which serves as the headquarters for the government’s military operations in eastern Ukraine, and which was likely the target for the main attack. The impacts on Lenin Street were located around a base used by border guard forces, which might have been the target of that attack. In close proximity to several of the submunition impact craters Human Rights Watch found remnants of the submunition’s stabilization fins and the pre-formed metal fragments (consisting of chopped steel rods) that are inside each submunition. Human Rights Watch also examined the tail sections of two Smerch rockets, one of which was still standing in the ground, and the remnants of a cargo section from a Smerch cluster munition rocket. OSCE monitors who investigated the area shortly after the attack concluded that the rockets were fired from the south-southeast. Human Rights Watch observations on the ground were consistent with this conclusion. At about 7 p.m. on February 10, the day of the Kramatorsk attack, cluster munitions were also used in an attack on Hrodivka, a small government-controlled town about 55 kilometers south southwest of Kramatorsk. A member of the local administration told Human Rights Watch that the attack wounded eight people, five civilians, and three soldiers. A doctor at a local hospital said that the hospital had received eight injured people, five civilians, and three soldiers, after the attack. The doctor also said that they had amputated one woman’s leg because of her injuries. When I heard the first explosion I sat down on the ground and covered my head as I usually do when we hear explosions. When I heard a second explosion and shrapnel started slamming into the gate next to me I lay down and could feel pain in my left leg. Only when I got home, however, did I see that it was a serious wound and I needed to go to the hospital. The attack also wounded 83-year-old Ivan Fedorovich in the hand and stomach. He showed Human Rights Watch a submunition impact crater right outside the gate to his house and holes created by pre-formed fragments in the metal gate. Human Rights Watch examined dozens of submunition impact craters, three cargo sections, and four tail sections from Smerch cluster munition rockets in Hrodivka. Some of the rocket remnants, which appeared to point in different directions, had landed in soft soil or showed signs that they had been significantly bent on impact, making it difficult to establish the incoming direction based on a single rocket remnant. However, three of the tail sections and one cargo section that were still firmly stuck in the ground indicated that the rockets had come from the southeast. Human Rights Watch observed a significant number of government forces at the southeastern edge of the city, close to one of residential areas that had been struck. The attack might have targeted these government forces. A vehicle-tracking database maintained by the citizen investigative journalist group Bellingcat includes three YouTube videos of BM-30 Smerch multi-barrel rocket launch vehicles allegedly in rebel-controlled area. According to the users who uploaded the videos, the vehicles drove through the town of Makeevka on January 22, February 10 (the day of the Kramatorsk and Hrodivka attacks), and February 22. Makeevka is near possible launch locations for both the Kramatorsk and Hrodivka attacks. Smerch cluster munition rockets were used in an attack on the city of Luhansk on several occasions in January and February, killing at least two civilians. Human Rights Watch investigated the sites of two cluster munition attacks on February 15. On January 27, cluster munition rockets were used twice in attacks on residential areas in the Artemivsk district in the western part of Luhansk. Medical personnel told Human Rights Watch that the attack had killed two civilians. One bomb landed right outside the door and the shrapnel injured me and my father. I found myself lying under the table in a pool of blood. The explosion broke my left leg. Shrapnel also hit my stomach. Eventually I lost consciousness. When Human Rights Watch interviewed Sergey, more than two weeks after the attack, both he and his father were still receiving treatment in the hospital. Human Rights Watch examined more than a dozen submunition impacts along Izvestkova Street and around school number 37, as well as fragmentation damage on walls, fences, and gates. Several buildings, including the school, appeared to have new windows, which local residents said had been installed because the attack had shattered windows. Residents showed Human Rights Watch stabilization fins and pre-formed fragments that they had collected after the attack. Human Rights Watch also examined the tail section of a Smerch rocket still stuck in the ground in front of 24 Patona Street, about 2 kilometers southeast of the Izvestkova Street impact area. The rocket remnant showed that the rocket had come from the northwest. OSCE monitors who inspected three cargo sections the day after the attack concluded that the rockets had come from north-northwest. In the second attack, submunitions detonated on and near Arktychna Street in the Zhovtnevy district shortly after midnight on February 12. The area is residential with detached houses. Human Rights Watch examined several craters in the road, a destroyed roof, and a stabilization fin and pre-formed fragments that local residents had gathered after the attack. Local residents said the attack did not kill or injure anybody. At least one rocket tail section appeared to have landed in a courtyard in the Ostraya Mogila neighborhood in the Lenin district, approximately 3.5 kilometers southeast of the submunition impact area. (There might have been other submunition impact areas and rocket remnants that Human Rights Watch did not identify). By the time Human Rights Watch examined the area, local authorities had removed the tail section, but the crater and descriptions by residents that had seen the rocket remnant before it was removed from the ground indicated that the rocket had come from the northwest. OSCE monitors who inspected the remnant the day after the attack reached the same conclusion. Human Rights Watch identified at least two rebel bases that might have been targets of the attack less than 1 kilometer from where the tail section landed. Given the direction from the northwest of the two cluster munition attacks and the 20-kilometer minimum range of Smerch cluster munition rockets, it would have been impossible for the rockets to have been fired from rebel-controlled area. On January 26, the OSCE monitors reported that they heard what they assessed to have been Smerch rockets being launched from near Spivakivka, about 70 kilometers north-northwest of Luhansk. Their observation provides additional indication that government forces had Smerch rocket launching systems in the suspected launch area in the period of the attacks. A member of an ordnance clearance team in Luhansk told Human Rights Watch that the team had cleared remnants from 23 Smerch cluster munition rockets that they had found in the city since the beginning of January. He also said that they had found and neutralized 17 unexploded submunitions, but that there were probably more. A clearance team member said that they had also recorded cluster munition attacks on January 24 and February 11. Between February 2 and 7 multiple attacks with Uragan rockets containing HE-Frag warheads and cluster munitions struck Komsomolske, a village about 40 kilometers southeast of Donetsk. Local residents told Human Rights Watch that a cluster submunition killed Aleksandr Trufanov, 42, and his 10-year-old son at about 10 p.m. on February 7. A relative confirmed their deaths. Human Rights Watch examined more than a dozen craters and impact sites, including damage to the walls and windows of a school, consistent with the use of cluster munitions, as well as a cargo section and pre-formed fragments and stabilization fins from submunitions showing conclusively that cluster munitions were used in an attack on the village. Human Rights Watch also examined three Uragan rocket remnants (tails) stuck in the ground, including near a school and in the center of the village. The rocket remnants that Human Rights Watch examined suggested that the rockets had come from the west. OSCE monitors who visited Komsomolske on February 3 concluded that the February 2 attack had originated from the southwest, suggesting at least two separate launching positions. At the time of the attacks, the front line was about 30 kilometers west and about 20 kilometers southwest of Komsomolske. With a range of 10 to 35 kilometers, the rockets could have been fired from either government- or rebel-controlled territory. However, given the systematic nature of the attack and the location of rebel forces in both Komsomolske and Starobesheve, which were attacked by cluster munitions in the same period, Human Rights Watch believes that the rockets most likely originated from government-controlled territory. A local resident said that cluster munitions were also used in an attack on Komsomolske on December 2, 2014, killing a 33-year-old woman. Human Rights Watch examined craters and damage to the wall, which were consistent with cluster munition use, at the site where the woman was killed. Human Rights Watch also examined several houses that had been destroyed by Uragan HE-Frag rockets in the same period. Local residents told Human Rights Watch that a HE-Frag rocket had killed two civilians on February 2, 2015, including a young girl. On February 6 and 7, cluster munitions were used in an attack on Starobesheve, a town about 35 kilometers southeast of Donetsk. The February 6 attack, at about 5 a.m., did not result in any casualties, local residents said. The February 7 attack, however, between 10 and 11 p.m., killed Vasyliy Lagunov, 46, as he was walking home from work. Local residents showed Human Rights Watch where they found his body and Human Rights Watch documented a submunition impact crater a few meters away. Lagunov’s father confirmed the death. Human Rights Watch identified two areas attacked with cluster munition rockets and examined more than a dozen submunition impact craters. A local rebel fighter showed Human Rights Watch six cargo sections from Uragan cluster munition rockets that he had collected shortly after the attacks, as well as a 9N210 submunition that had failed to both explode on impact and to self-destruct one minute after being dispersed. Human Rights Watch also documented damage likely caused by HE-Frag Uragan rockets. Because most remnants had been removed shortly after the attacks, Human Rights Watch was not able to establish independently the direction of the attack. Local residents told Human Rights Watch, however, that the February 7 attack had taken place at the same time as the attack on Komsomolske, indicating that they were part of the same attack. At about 4 a.m. on January 23, cluster munitions were used in an attack on the center of Stakhanov, a rebel-controlled town 45 kilometers west of Luhansk. The head of the local hospital told Human Rights Watch that the hospital had received and treated three civilians after the attack. Human Rights Watch examined three cargo sections and three tail sections from Smerch cluster munition rockets that were still stuck in the ground. The remnants indicated that the rockets had come from the northeast, north, and northwest. At the time of the attack, the front line was about 15 kilometers from Stakhanov to the northeast and north, making it impossible for Smerch rockets coming from that direction to have originated in rebel-controlled area. At a collection point for remnants of weapons, Human Rights Watch counted parts from more than 30 Smerch cluster munition rockets and a few Uragan cluster munition rockets that a local clearance team had collected from Stakhanov and surrounding towns. The clearance team also showed Human Rights Watch nine unexploded submunitions that they had collected after the January 23 attack. On the day when Human Rights Watch visited, more than three weeks after the attack, the clearance team found and removed an unexploded submunition from the grass next to a pedestrian street in the center of town. At least two civilians were killed in the town on January 21, according to local residents, but most likely by HE-Frag rockets, not by cluster munitions. Both the Uragan and Smerch rockets are “designed to engage manpower and soft-skinned materiel in concentration areas,” according to its manufacturer, Splav SPRA, based in Tula, Russia. The Uragan cluster munition rocket can deliver 9N210 or 9N235 submunitions, while the Smerch cluster munition rocket can deliver only the 9N235 submunition. The 9N210 and 9N235 submunitions contained in these rockets are identical in size, shape, and color. Each submunition has six rectangular black metal pop-up stabilization fins at the end opposite its impact fuze. The key difference between the two types of submunitions is the size, shape and number of the fragments. The submunitions are designed to self-destruct at a set time after being ejected from the rocket. Source: Russian Federal State Unitary Enterprise “Splav State Research and Production Association” webpages -- http://splav.org/en/arms/uragan/m27k.asp and http://splav.org/en/arms/smerch/m55k.asp -- accessed March 17, 2015.